Write Place is a free service available to all UD students. 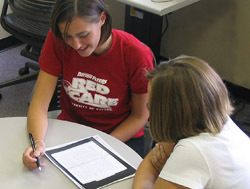 Write Place offers peer writing support on any writing assignment and at any stage of the writing process. Students can drop in without making an appointment. The hours are Monday through Thursday from 10am to 8pm, 10am to 2pm Friday, and Sunday from 4 to 8pm. It is located in The Knowledge Hub on the first floor of Roesch Library. These citation generators can help you format a Works Cited List or Bibliography. NOTE: it is your responsibility to make sure the citations are formatted correctly.